The Integrated Research Training Group in Mitochondrial Biology (mito-RTG) programme specifically designed for the doctoral candidates (DCs) and Postdocs participating in the projects of CRC 1218 provides them with the best possible scientific and team environment, guidance, mentoring and teaching. 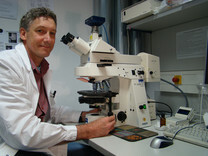 The mito-RTG is embedded in the Graduate School for Biological Sciences (GSfBS), which is a registered study course offering workshops in scientific as well as transferable skills. The Steering committee and the manager will take care of all matters of the mito-RTG.